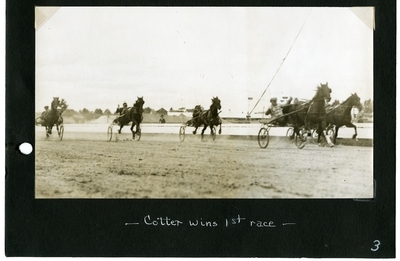 Black and white photograph of the finish of the first heat of the 2.25 Class Trot, Wednesday, September 29, 1937, at Cold Spring Park, Rochester, N. H. Bay gelding, Cotter (second horse from the right), A. Hebert up, claimed the first and third heats of the contest. Coming in second place in the first heat was bay gelding, A. J. Chestnut mare, Madge O'Conner finished the heat in third place.